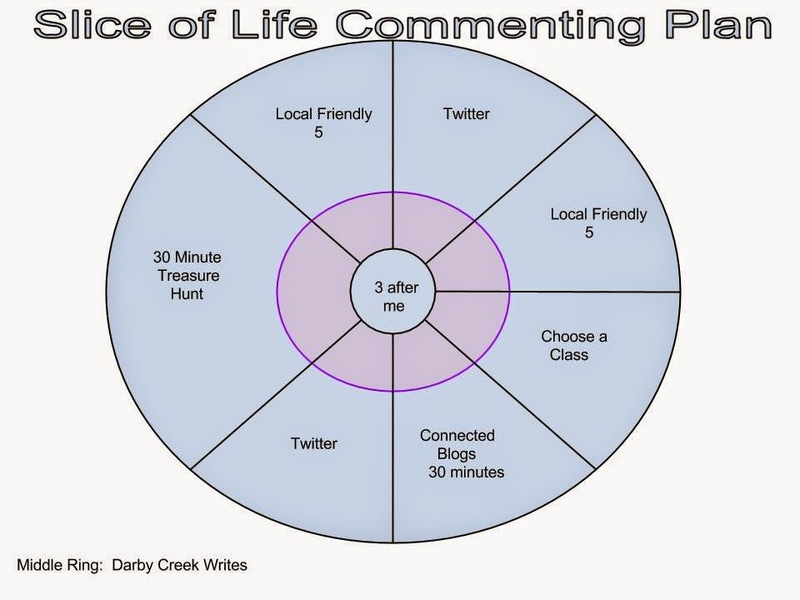 The students, first through fifth grade, were gathered on the carpet as we talked about what they had learned from the Slice of Life Writing Challenge when A spoke up, "I just noticed the sign hanging on the bulletin board," she said. Turning around, I searched to see what she had noticed. "Don't cry because it's over. Smile because it happened," I read to the group. The room got a little quiet. Looking at her, I smiled. She had invested so much heart into this challenge. One of our fourth grade participants, she shared so many stories across our challenge. We all paused for a moment to consider the statement. We had all learned so much during the month long challenge. I think the students learned a lot about themselves as writers. Many managed to write most everyday, even across spring break. Students had taken time to share their writing and to comment. The students have learned to do so many things. They've learned to consider their audience and the power of their words. They've learned what a community can do for one another. They've learned to support each other, and go to each other when they need help. They've learned to insert pictures and videos, write catchy titles, and ask questions to encourage commenting. Today happiness was found in our after school Slice of Life meeting. We all knew today was the last day of the challenge. We have one more meeting - our celebration! I'm going to miss this group. When writing got hard, I reminded myself that if these young writers could do it, I could too. Normally I start my day with coffee. There's something about the smell of coffee filling the house that helps get the day off to the right start. This morning, the first day back from spring break, I walked out to the kitchen and started my pot of coffee. When I went to make my cup of coffee, it just didn't sound good. I tried to drink it, but barely made a dent in the cup. What has happened to my morning drink? Has it been replaced by - wait for it - orange juice? Yep, I seem to be back in love with orange juice. I'm really not sure what is going on exactly. All I can tell you is that last week I picked up a bit of a virus. After spending an entire night sick, I was able to calm my stomach with some Sprite and my grandma's old stomach remedy. I'm not sure how it went exactly, but I have made it something like this: a teaspoon of Sprite on crushed ice repeated again at 15 minutes. If that stays down, gradually increase the amount of Sprite though the time increments grow a bit too. Of course, I found that nothing really sounded good. It was days before I ate much and certain foods don't sound good yet. For some reason, coffee is one of the things I haven't really had a taste for since I have been back on the road to recovery. It doesn't really make sense; I hadn't had coffee before getting sick. Still, coffee just doesn't sound good, but orange juice sounds divine. There's something about the golden orange drink chilled to just the right temperature that makes me smile. This morning I stopped by the our local Circle K to pick up a small bottle on my way to school. This evening I stopped at the store to pick up a container of orange juice to have at the house so there isn't a crisis in the morning. It seems my habits are on reboot so I might as well make the best of it. Perhaps orange juice might be a healthy alternative to coffee for now. Of course, this isn't the first time orange juice and I have been close friends. There was the time we drove to Florida when I was child. When we crossed into Florida, after driving for what seemed like days, we were greeted by free orange juice. That was perhaps the best orange juice I have ever had. Was it because it was free? Was it because it was actually in Florida? Was it because I was just thankful to get out of the car? I have no idea. Then there were the "TANG" years. Yes, my grandma was a big fan of TANG. She made us drink a small class before breakfast to "clean the flues out" each morning. Oh, TANG. Those were the days. What's up with orange juice? I really have no idea, but for now I'm going with it. I have orange juice ready for the morning. A little glass of sunshine to start the day seems the perfect ticket to happiness. For the month of March I will be participating in the March Slice of Life Challenge hosted at Two Writing Teachers. It will be a busy month of writing, commenting, and learning with this community. This year I've decided to try to focus my writing around happiness. Stop by today's link up to join the conversation or find some great reading. Today we went on a bit of an adventure. When I had last visited my mom I had managed to find a bench with a great view to the water while on a walk one lazy afternoon. Of course, I wasn't really sure where that bench might be, but with a few bits of logic we began to narrow the possibilities and took off to find it. We knew it had to be close. I wasn't likely to have walked too far in this hilly place. I always joke that I'm from the flatlands. I'm not used to mountains. My mom, however, assures me they are just tiny foothills. We went down the road I figured was most likely to be the one I would have chosen to wander. It wasn't too far from the road to my mom's house and was pretty easy to access. When we came upon a steeper than normal hill, my daughter quipped she doubted I would have gone down that hill knowing I would have to come back up it. She had a point, but I could see water. I knew I'd break this rule to be near the water. We ventured down the hill. Down, down, down, we climbed. Of course, I knew soon we'd have to go right back up, up, up. As we got to the bottom of the hill we could see the spot. The bench sat near the water, surrounded by tall thin pines shading it from the sun. We sat down for a minute and enjoyed the view. It was a quiet place. You could see water on both sides and gently rolling foothills seemed to hold it in place. The only boat was a small fishing boat that was quietly poised to spend some time hoping for a big catch. The scene was just as I had remembered it. The water quiet and so clear you could look down into it. The bench allowed one to sit and watch for as long as desired. Since I had found the bench last, they had added a small boat dock to the area, some picnic tables, and a few grills. It looked like a great place to just stop and hang out. The bench sat alone to the side. There's something calming about being near water. With the sun reflecting from the lake, the color is intensified. Do people who live near the water ever take it for granted? I'd love to have a place that makes me want to pull my paper out and try to write; where the challenge each day would be to try to capture the wonder in a photograph. Happiness can always be found near water. When you need a minute to sort things out the water calls to you, "Sit down for a bit. We'll think about it together." Before you know it, the water has taken all of your cares away and replaced them with something better to consider. If spring won't come to you, go find spring. Happiness is found in signs of spring. with brush strokes of color? the blue of the sky? from a long winter slumber? It's Poetry Friday! Stop by Check It Out where Jone hosts today's parade of wondrous words. Waking up to sunshine and green. Walking on hills is more work. An afternoon walk ends in surprise. 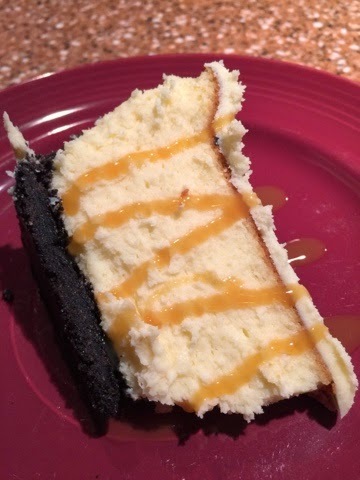 No dessert tastes like delicious cheesecake. Defeat in euchre isn't the end. Wisconsin Badgers move onto elite eight. Some days you work a little harder to find happiness. Some days are a little cloudier, and we have to really look for sunshine. Somehow a virus won the battle earlier this week, putting me behind on all of my lists. Today I have places to be, but the things I had hoped to have accomplished need to be put aside until there is time to do them. I know they'll wait, but wish I could've stayed on course. The change in plan, makes me have to look a little harder and search a little deeper. Despite the lack of accompishment, I tried to look forward. I had an appointment for a much needed haircut. Happiness wasn't found in having someone else fight with my curls to straighten my hair. It wasn't found in finally being able to eat something. It wasn't found in the sight of dogwoods finally in bloom or in mountains and rolling clouds playing together in the evening sky. Tonight happiness was found in being able to set the list aside and focusing on things that matter most. Sometimes we have to give ourselves a little space, a little room for error. Sometimes just being able to take things as the come to us is the best way to find happiness. There's beauty in clouds too. It was the first official day of spring break....so it was snowing. It seemed the perfect day to tackle my closet. It was time to clear out some of the items I had been hanging onto for far too long. I began pulling things out, sorting items into piles, and trying to begin to weed out what needed to go. It wasn't long until I managed to get the clothing and the shoes under control, and then moved onto the bags. Somehow I have quite a collection of old wallets and all those small cosmetic bags that are given away for free. I'm really not sure why I hang onto them. I could hold my year's supply of cosmetics in my hand. For me the best way to keep my closet under control is to only allow a particular amount of space for things I need. Pants have so much room in the closet. Shoes have a spot. Sweaters must fit on the shelf. I have a cloth box I use to store the wallets and bags I plan to keep. They need to all fit inside of the container which means a few needed to go. As I sorted through to determine those I would keep, I had to smile. For some reason, all the sorting of small bags reminded me of time with my grandma. She used to let me play in her shoes. I'd walk around the house in every pair. My grandma was stylish so she had shoes in every color. It was a little girl's dream playground. She'd let me do the same with her jewelry and her bags. I could never believe how many bags my grandma had. I knew she hardly used any of them and always wondered why she kept so many. I guess in time you just collect things. They're too good to get rid of, but you don't continue to use them yourself. Has I picked up a bag, then a wallet, then another bag, I shook my head. I suddenly understood how my grandma had so many bags. I really only use a bag or two of the twenty I put back into the container. Why I hang onto them, I have no idea. 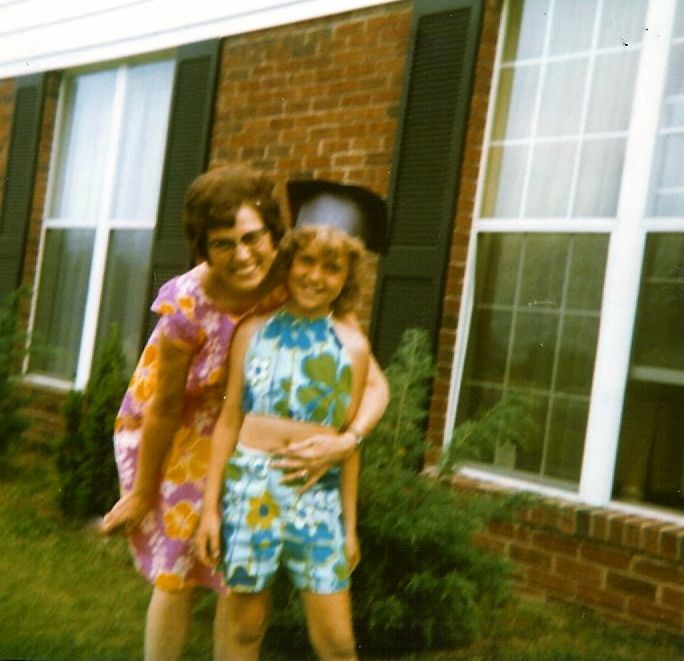 Maybe I'm a little like my grandma. I know. I know. It's hard to believe I'm a fantasy sports fan. Let me tell you, it's probably even harder for those who have known me forever to believe, but it's true. Today was our fantasy baseball draft. It was an important day as I have a championship to defend. The Five Tool Playas are ready for action! In honor of the event, I decided to try writing a poem using Visual Poetry. Kevin Hodgson shared the app in our Digital Maker Playground. I've been wanting to give it a try. Today, happiness was found in the start of baseball season! I was back in Ramseyer Hall where I took many of my education classes years ago. Listening to a professor talk about the work we would be doing. There's something about the way they talk in the academic world that I always find so interesting. The possibility of the road ahead. There's something about trusting a process enough to know a direction is all we need to begin. Working alongside people you know will push your thinking. Discussions that make me think and revise what I know. This morning, I'm awake to watch morning arrive. I suppose I should wish I was still sleeping, but I love this part of the day. There's something about the quiet of morning. There's something about watching the world turn from night into day. Happiness is found in the early hours of silence. It's day 20 of the Slice of Life Challenge --- and Poetry Friday. What's not to love about that! It's Poetry Friday! Stop by Reading to the Core where Catherine hosts today's parade of wondrous words. M stops by my room every morning on her way to her classroom. She usually wants to talk about a book she is reading, a post she is writing, or another new discovery in her world of learning. Every morning I make sure I have a minute to chat with her. She's always teaching me something, but what catches my attention most is the way she loves to learn. She's always on the search for the next thing she is going tackle. Tonight I spent the evening with our Digital Maker local group. The Digital Maker Playground is an online community creating around selected makes using a variety of digital tools. As a connected community, we are learning much from one another. Julie Johnson and I are hosting the virtual group that includes participants in a variety of locations around the world. Every other week, we host a Digital Playground LIVE Workshop for local participants who want to have a bit of work time, the support of their peers, or just a little conversation as they create. Our group is full of people like M who love to learn. The energy in the live workshop, as well as in the virtual community, is contagious. Today happiness is found in hanging out with other learners. I love the constant questioning, the new discoveries, the willingness to try and try again. There's something about being with people who understand there isn't just one way, but a million ways to puzzle something out. There's something about being in the company of people who make you continually change your thinking. There's something about being with other learners on this journey. Stop by the playground to see the latest creations. Our newest make is "lift a line from literature." Of course, everyone is welcome on the playground. If you like what you see, please join us. I'm not a DVR fan. For years I watched my family spend too much time in front of the television because of the DVR. They recorded sitcom after sitcom, movie after movie, series after series. I never knew what was going to be on the television when I would walk into the living room. There were so many days I wished the DVR wasn't invented. Back in the day - yes, the day when cartoons were only on Saturday morning - you watched a show when it was on TV. It was the only way you'd get a chance to watch it. For a long time, you couldn't record it, watch it later, or see it on demand. Of course, now the DVR allows us to record anything and watch it at our convenience. It's a trap I've tried to stay away from in my life. To be honest, I try not to watch too much television. I just don't have the time to invest in a series. There are books to be read, posts to be written, students to be ready for each day. 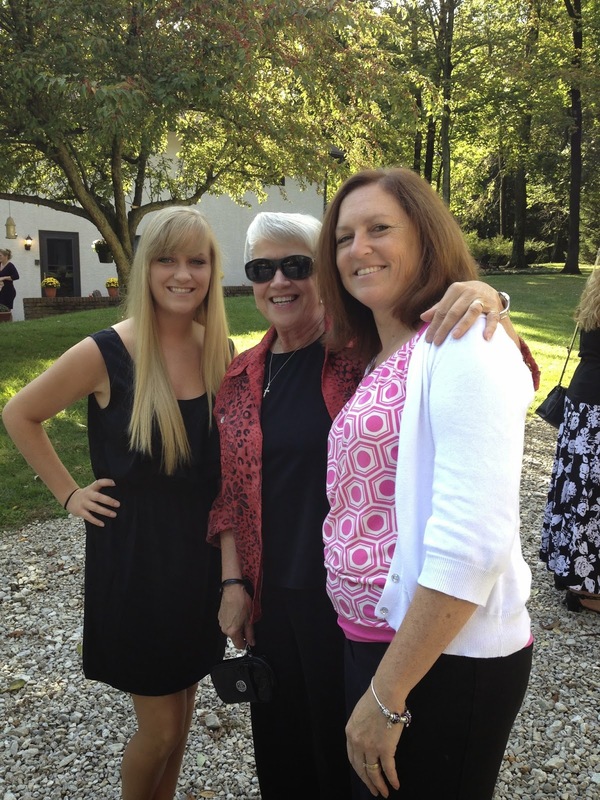 I want to have time for my family, for taking care of our house, and for getting things done. There really isn't room for television in my days. I've pulled myself away from sitcom habits, steered clear of reality television, and avoided getting caught up in the drama of a series. Staying away from television means I've become a cultural flop, but I survive. Life without television was working well for me, and then came my fall. It was the usual perfect storm: a friend talking about American Idol, another friend talking about American Idol, Facebook posts about American Idol. I'd watched the show years ago when the original judges were on board, but I got tired of the judge drama and the negative comments given to contestants. I gave it up. The conversations of the new season were playing in my mind when I sat down one evening to find it on television. I started watching. Five minutes turned into fifteen, and fifteen turned into an hour. One night turned into two nights, and two nights turned into three. I was hooked. The new judges were so kind to the contestants. There didn't seem to be the making fun of people that had taken place in earlier years. The contestants were so much more talented right from the start. I enjoyed watching the way the contestants took the feedback from the judges and came back stronger each time. Well, it didn't take long for me to realize I wasn't going to be able to keep up with the show and my life. Yep, cue the music. I had to DVR it. I couldn't always watch on the night it was scheduled so the DVR made it possible to watch at my convenience. There was the added bonus of watching a one hour show in hardly thirty minutes by skipping commercials. Maybe I need to rethink this whole DVR thing. Today happiness was found in the DVR that allowed me to get caught up in less than two hours. Watching the three judges give feedback, the contestants rise to the occasion, and the lessons learned along the way is inspiring. Tonight as I watched the last episode which aired last Thursday, I had to smile as Keith Urban talked with Tyanna about her interview. He looked at Tyanna and repeated her words to her, "You said, 'I want to do this forever.'" He went on to add, "Some people sing and have this attitude, 'Look what I can do or look what I have to do,' but you say 'Look what I get to do today." Isn't that when life is at its best, when we get to do what we love to do everyday? I guess I'm going to have to quit talking smack about the DVR. It seems that it may have a place in my life for now. I may be on my way to being cultured yet again. My family is just thrilled to see my "American Idol" shows tucked into between "Justified," "The Americans," and "Switched at Birth." Tonight I'm grateful for the DVR that allowed me to get caught up and ready for tomorrow's new episode of American Idol. Tonight we're supposed to be able to see the Northern Lights beginning at 9:00. I'm not much of an astronomer so I'm embarrassed to say I really wasn't even sure where to look. Pulling the sliding glass door open, I stepped outside into the cold crisp night air. I looked to north. I looked to the south. I turned in circles on my patio. Was I looking for a cloud of light? Was I looking for more twinkle in the sky? Gazing up into the ebony sky, I stopped turning and stood motionless. 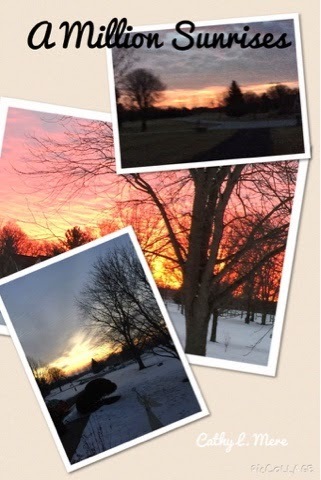 I didn't see the Northern Lights, but I did see the beauty that takes my breath away night after night. Looking up the stars stared back at me, shining in the night sky. I went back inside to get my phone so I could take a picture so you could see it too, but the camera can't capture the contrast between the glistening lights and the backdrop of darkness. We live in the country, away from the lights of the city, so the stars glimmer and dance above our house. I'm never sure if I am watching them or if they are watching me. There's something about looking up to see millions of tiny dots of lights, varying in brightness, staring back at the earth. Pausing I recognize a few constellations, but mostly just gaze in awe as millions have done before me. If the stars could talk, what stories would they tell? What did my grandmother wonder as she gazed at these same stars? And her grandmother? Years from now will someone wonder what we thought about as we admired the night sky? I still haven't spotted the Northern Lights, but I have certainly found a bit of peace in this busy day. Happiness is found in the night sky, where the stars speak without words. Where stories are tucked away and secrets are hidden. Where hope is found. Where yesterdays, todays, and tomorrows are woven into the seamless blanket of time. Today we took our youngest back to college. She has been home all week for spring break. The week went from cold and icy to sunny and warm. Happiness was spending time with her. until late in the night. Sometimes when you don't know where to begin, it's easier to just not begin at all. That's how I feel about commenting this year in the challenge. It's so overwhelming. There are so many blogs I want to visit everyday, but there just isn't the time. This year I am hosting a school group of students participating in Slice of Life. I want to get to their blogs to comment. Additionally I have numerous friends, both local and across the internet, I know I want to find time to read. Of course, I know there are new blogs waiting to be discovered as well, but with over 200 people posting every day where does one begin? My personal rule is to comment on at least three blogs anytime I participate in a collaborative blogging event. This year I've wrestled with several plans, but still worry about all that I am missing. Today I decided to make a plan that I could stick with for the final two weeks of the challenge. I took the groups I know I don't want to miss and divided them across seven days. Each day I will choose one spot and focus my comments on that group. I'm going to choose each day, but I can't go back to the same space in a week. The Core: Everyday I will begin by commenting on the three blogs who have posted right before I do. Our School Challenge: Everyday I will approve the posts from our school participants and comment on at least 5 posts. Twitter (2 days in the week): I will go to the Twitter hashtag #sol15 and comment on at least three posts that have been tweeted by participants. Local Friendly Five (2 days): Many of my friends, and even some family members, are participating in the challenge. Many of these slicers live close to me. I don't want to miss this group so I will be commenting on at least 5 from my local friendly circle. 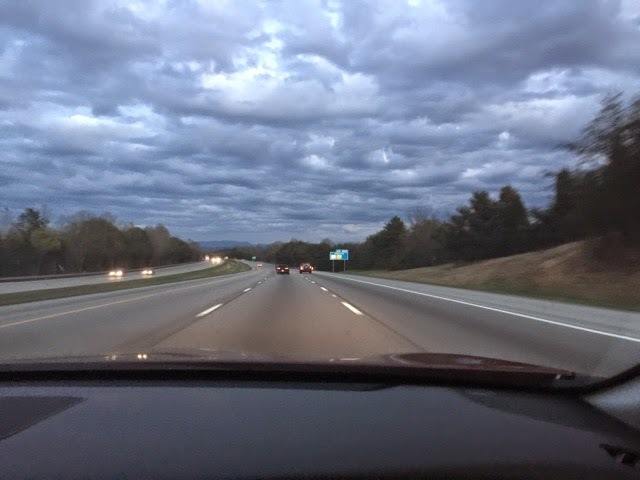 Connected Blogs: In the years I have been blogging and using Twitter, I've come to know many other educators and bloggers who continually inspire me. We often collaborate with one another across blog events. I know I can go to this group with a question anytime and will have immediate help. One day each week I will devote to making sure I stop by some of the "connected blogs" I like to visit. Choose a Class: I wish I had time to stop by every class every day, but I don't know how to make that work. One day each week I will choose a class to read and comment. 30 Minute Treasure Hunt: I love this one. I'm going to find a starting place from the comments in Two Writing Teachers. I will go to a blog, read, and comment. Then looking through the comments I will go to the blog of one of the commenters, read, and leave a comment. Then repeat. I will continue the treasure hunt for 30 minutes. Here we go! 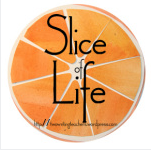 It's time for the March Slice of Life Challenge hosted at Two Writing Teachers. It will be a busy month of writing, commenting, and learning with this community. This year I've decided to try to focus my writing around happiness. Stop by today's link up to join the conversation or find some great reading. How this man made it through my teenage years, I have no idea. 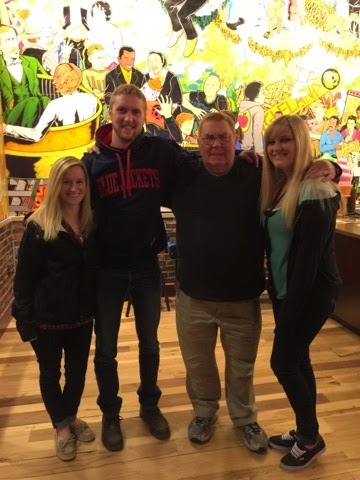 Today we helped Dad celebrate his birthday with dinner at Melts. 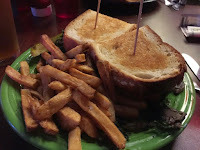 Melts gives new meaning to grilled cheese, and my dad gives his own meaning to the word dad. I am grateful to have a dad who loves random drives, coffee shops and hanging out. He's taught me to kick back and has been the perfect grandpa for our kids (well, usually...that's a long story). Happy birthday, Pop. Happiness is celebrating the best dad a girl could ask for in this life. I'm a list person. Making lists is nearly as fun as crossing things off. There might be nearly a dozen list apps on my phone. I scratch lists on napkins, scrap paper, and post-its. Making grocery lists, to-do lists, and idea lists are just some of the ways I like to keep myself moving. When I'm busy, a list helps me get things done. My family often jokes that I will always have a list because before I finish one list, I'm already writing another. It's crazy, but I like to be busy. While many search for balance, I think sometimes the best things in life happen when we are a little out of balance; when we're giving a little more to one place or another. Today was a busy day, but it was a good busy day. It wasn't a day racing from place to place or event to event. It wasn't a day completing piles of paper work or completing my taxes (yep, that one is coming soon). It wasn't a day spent cleaning the basement or reorganizing the closet, instead it was a day of interesting work, learning, and conversations. Across the day I worked with readers, caught up with teachers, rearranged schedules, attended meetings, rethought teaching points for some of my students, and then after school it was off to run errands. When I finally made it in the door, my husband looked at me and said, "We've already decided about dinner." Music to my ears. Yes, delight is found in someone else figuring out dinner but, honestly, happiness in being good busy. THRUMP, THRUMP, THRUMP. My alarm bellows loudly across the bedroom. I'm already in the kitchen making coffee. My husband calls jokingly from the bedroom, "Why do you set an alarm clock?" as he pushes the button to stop the sound which is getting louder and faster. It's true. I'm a morning person. To be honest, I don't even know why I set alarm. I guess I'm just sure the one morning I don't set an alarm will be the morning I sleep later than I should. If I want to accomplish anything in my day it needs to be done early. I always try to get my hardest work and thinking done while the day is young. If the early bird gets the worm, I should be ready to go fishing. When the kids were young I guess it was the best way to get a few things done before the day got busy; then waking up early just became the way I worked. Even on weekends I wake up early. There's something about getting up with the sun, pouring a cup of coffee, sitting down on the corner of our couch, and getting started with some writing. I get up early, but a night owl I am not. I'm envious of people who can stay up late and be productive. I'd be excited if I could just stay awake long enough to watch the eleven o'clock news. When everyone gets together in the evening, I am most likely to be the first person to have to call it a night. I just can't stay awake. Since the new year, I've slowly gotten myself into even more of a routine of going to bed early and getting up before the sun rises. Each week, the time I was waking up was getting earlier and earlier on the weekends. 7:30. 7:00. 6:30. 6:00. 6:00. 5:30. 5:15. 5:00. It was becoming ridiculous. I've always had a rule with myself that if I'm awake and can't sleep I just get up and do something. Sometimes I catch up on email. Sometimes I read a book. Sometimes I get a few words jotted in a notebook. Sometimes I enjoy poetry. I just don't sweat not sleeping --- and not sleeping has never been an issue. This waking up early, however, was becoming a problem as my day seemed to be starting earlier and earlier. Though I used to have a rule to NEVER get up before 6:00 in the morning for just about anything, it was quickly becoming uncommon for me to be able to stay awake until 6:00. I was seeing more of the morning than even I like to see. As 5:00 became the norm and 4:30 was starting to be a time I sometimes saw on my clock, I knew I had to get this under control. I realized I was going to have to start making myself go back to sleep or my problem was going to get out of hand. No more reading. No more playing Words with Friends. No more getting up to write. I had to start getting back to sleep. Then came Daylight Savings Time. Yep. You read that right. In years past I would have whined for days, maybe weeks, about the spring time change. "Where'd that hour go?" I would have complained. "I will never be able to get out of bed," I would have groaned. For weeks after the time change I would have moaned about being tired. Too tired to work. Too tired to read. Too tired to function. This year was a completely different story. This year Daylight Savings Time was a gift. What happened to my 5:00 in the morning wake up time? It's become a 6:00 in the morning wake up time, and that's the perfect time to get the day started. I would never have thought happiness for me would be found in Daylight Savings Time but, for the first time ever, I'm a big fan!!! Maybe it was the warmer temperatures. Maybe it was the sunshine. Maybe it was the fact that I hadn't had a soda for nearly three months, but today I found happiness. For some time, my daughter worked to get me to quit drinking diet pop. She preached about the problems with drinking so much diet. "The artificial sweeteners aren't good for you," she said. Every time I poured a drink of diet soda, she had another reason I shouldn't be drinking it. I knew she was right, but every one needs a vise or two and I was quite sure there were worse habits I could have. One day I poured the fizzy brown liquid over some crushed ice in my favorite glass, and she started lecturing me again. "I'll tell you what," I retorted, "if you get a 3.75 in your first semester of college, I will quit." I'm not really one to give grade rewards or make bets, but it seemed like a way to put this to rest for a bit. It came out of my mouth before I could really think about it, but she was ready to take that challenge. Summer came and went. We packed Cassie up and took her to college. Weeks passed. The first months of college were going well, and I knew it was looking like I might have to hold up my end of the bargain. As grades came in it appeared I was going to lose. Being the sport she is, she gave me through the holidays to enjoy the tasty beverage. The holidays came and went. The calendar turned to a new year, and it was time to make some new changes. With the last Diet Pepsi gone from the refrigerator, I stepped up to the challenge. Water it would be. If I was going to make this change, I really didn't want to replace Diet Pepsi with a new habit. The first two weeks were rough. I drank water with lemon, water with raspberries, water with cucumber, water with strawberries, but I really wanted a diet soda. This was going to be tough. A few weeks into the switch I swung by to pick up dinner in a rush on my way home. I hadn't had a pop in a few weeks, so I thought why not give one a try. I have never been one to completely give up something. "Everything in moderation, nothing in excess," my grandma always preached. I placed our order and moved toward the pickup window. After paying for our meals, the diet soda was passed through the window. It was just the way I liked it, poured on crushed ice. It felt good to hold the cup in my hand. It had been too long. We were together again. Me and Diet Pepsi. Diet Pepsi and Me. 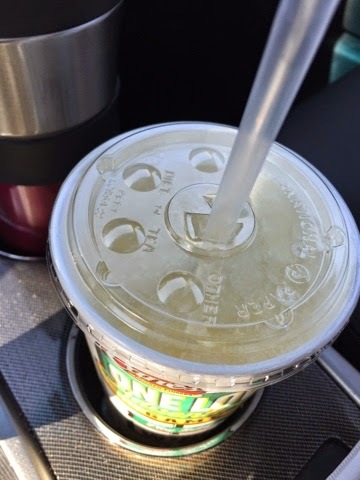 Quickly I tore the paper off the straw and put it into the cup. Without hesitation I took one sip, and nearly spit it out. It didn't taste good anymore. How could this be? Months have passed since I gave up diet soda, and there are still times I miss it. I miss it with pizza, when friends run out to grab lunch, when I get home at the end of the day, with chips, but most of all I miss it when I go through a drive through. Today the sun was shining and it felt like spring when I went to pick up lunch. Oh, I really wanted a Diet Pepsi. That's when I saw the lemonade on the sign. Maybe it was the warmer temperatures. Maybe it was the sunshine. Maybe it was the fact that I hadn't a soda for nearly three months, but today that lemonade was exactly what I needed. It didn't have the fizz of a Diet Pepsi, but it was on crushed ice, just the way I like it. Who knew happiness could be found in a lemonade?